The Moto G5S Plus runs Android 7.1.1 Nougat, and we can't really fault it for not having Oreo as it did, after all, come out all the way back in August. Oreo is coming, though, so no worries. The look and feel of the Moto G5S Plus' software is for the most part that of stock Android. The Moto G5S Plus' fingerprint scanner can be used in a number of ways. The obvious one is to wake/unlock the phone - it is always-on, very fast and quite reliable. For navigation purposes, as part of Moto Actions, it can fully replace the on-screen nav bar - tap to go Home, swipe left to go Back or swipe right to switch between recent apps. Gestures get detected pretty accurately, though you may find the left-right mechanics a little counterintuitive if you switch hands often. Pressing-and-holding the sensor for a short time will lock the screen, while a longer press will summon the Google Assistant. These two overlap and mastering them does take some time, but it's ultimately a great way to do away with the on-screen navigation bar in case it's not your thing. 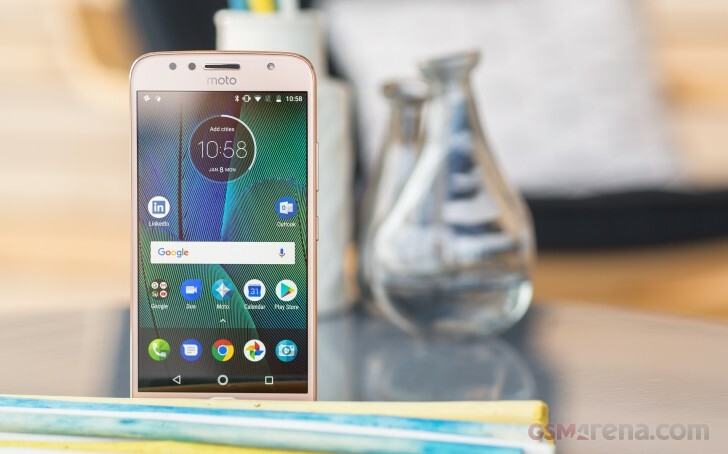 Moto Display is another long-standing proprietary feature - it now comes with an updated clock design with an integrated battery ring, a blue-colored theme and direct-replies from the locked Active Display. There's no way to change the color, but you can select which apps to block, choose how much detail to show, and toggle the quick reply feature. Also part of Moto Display is a new feature called Night Display - the phone will display warmer colors to filter out the blue light that's known to mess up your sleep according to research. In the Moto actions category, you'll find gestures like 'pick up to stop ringing', which most phones have, but a couple that are unique to Moto are "chop twice for flashlight", and "twist for quick capture". As for multimedia, it's all in the hands of Google and its default apps. Google Photos is in charge of gallery-related tasks and video playback, while Google Play Music is the audio player. There's an FM radio too, with RDS and recording capability. The Moto G5S Plus is powered by the Snapdragon 625 chipset, a super-popular midrange SoC, and rightfully so - the 14nm chip blends excellent power efficiency with adequate performance. The former we already established to be the case once again, let's have a quick look at the latter. The numbers are hardly surprising - after all we've tested a whole lot of Snapdragon 625 phones, and the Moto G5S Plus isn't much different. In single-core CPU tasks it's on par with its predecessor and the Moto X4 (S630 and a slightly higher clocked processor), while the HTC U11 Life (S630, again), the Xiaomi Mi A1 (S625), and the Honor 7X (Kirin 659) marginally outperform it. The Snapdragon 625 uses eight Cortex-A53 cores. A Cortex-A72 core is inevitably vastly more powerful as represented by the Galaxy A8 (2018)'s Exynos 7885 Octa chipset in the chart below. We've included the Samsung mostly for reference as it's about twice as expensive and not really a direct competitor. Same with the Oppo R11s and its Snapdragon 660 with them Kryo cores. In the multi-core part of GeekBench, the Honor 7X lags behind the Moto G5S Plus, but the Mi A1 is mostly keeping up with Moto's pace. The U11 Life is thereabouts as well. The Snapdragon 625 never had much ambition in the graphics department and GFXBench only proves that Motorola didn't mess anything up and utilized the whole potential of the Adreno 506. The Moto G5S Plus is thus on par with the old model and the Mi A1, while the U11 Life and Moto X4 are ahead thanks to a more powerful Adreno 508. The Honor 7X, on the other hand, can't match the G5S Plus' framerates. Bring CPU, GPU, storage and RAM performance together and you have an Antutu score. It's mostly a lot of the same thing here between the Snapdragon 625 devices while the Kirin 659-powered Honor 7X and the Exynos 7880 Galaxy A7 (2017) are in the same pack. The S630-powered Moto X4 and U11 Life are a notch above, while the Galaxy A8 for this year surges ahead, though it can only dream of catching up with the S660 Oppo R11s. Predictable performance is what we got out of the Moto G5S Plus. It's no powerhouse, but it's more than adequate for the usual stuff. Snapdragon 630 phones will give you a slight improvement in 3D tasks for not a substantial premium, while the Honor 7X and its Kirin 659 is more or less evenly matched.